For children: send at least 1-2 ml of whole blood in a lavender top tube containing EDTA. If sending blood on a hot day or in a hot environment, ship blood at 4 C with a cool pack. 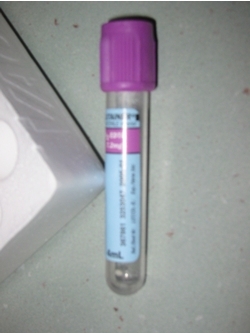 Lavender top tube: This tube contains EDTA as an anticoagulant. For adults: send ~8 ml of whole blood in a yellow top tube containing ACD. For children: send ~4-7 ml of whole blood in a yellow top tube containing ACD. DO NOT SHIP OR STORE ON ICE! Blood for lymphoblastoid cell lines must be kept at room temperature. 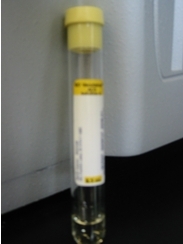 Yellow top tube: This tube contains ACD and is used for special tests on whole blood. For either fibroblast or lymphoblastoid cell lines: send (2) T25 flasks at room temperature. As outlined above, MITOMED has the capability of establishing lymphoblastoid cell lines for you. If testing on fibroblasts is desired, a previously established cell line must be shipped to MITOMED as described. For Frozen tissue: minimum (50mg) send frozen over night with ample of dry ice. ALL samples described above (whole blood, T25 flasks) should be shipped by overnight mail. Please contact MITOMED if any delays in shipping are anticipated. Samples can be received Monday through Friday, 8am to 5pm. Do not mail samples on Friday. Please fill out one of our test requisition forms and ship with all samples to the address on the form.